Maui Preserved products on sale at Whole Foods Market in Kahala. Photo courtesy Kerry Wilkins. Just listed as being among the “Best of Hawaii” by Hawaii Magazine, their products are now being sold at Whole Foods Market stores in Kahala and Kailua on Oahu, as well as the Whole Foods Market in Kahului on Maui. As part of Maui Preserved’s local launch, company co-founder Anthony LaBua-Keiser will be doing a demo at Whole Foods in Kahala this Saturday, October 20, from 1 p.m. to 5 p.m.
Photo courtesy Kerry Wilkins/Maui Preserved. 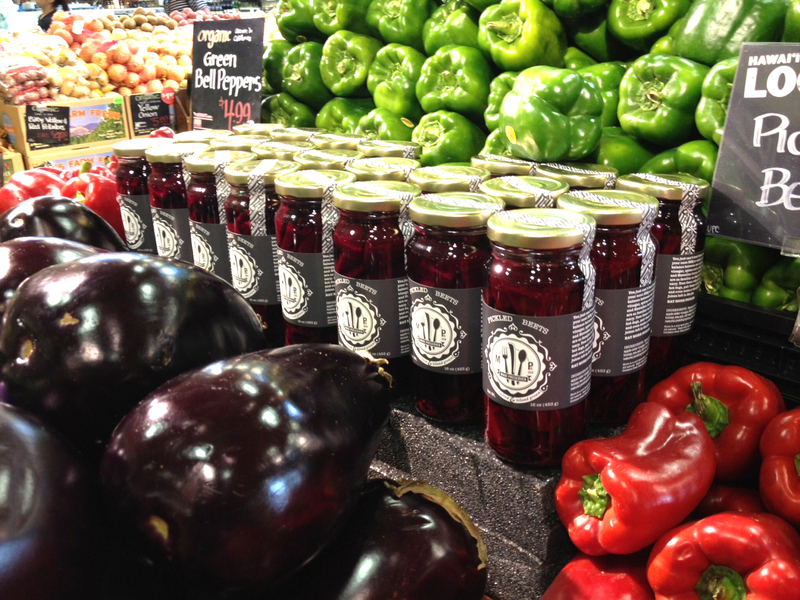 With green tea in our pickled beets and pineapple steeped in Hawaiian chile pepper syrup, Maui Preserved bottles our dynamic food culture here in Maui. Maui Preserved is rooted in the idea that eating locally, Maui grown fruits and vegetables is not only good for our health and community but intensely delicious. Rich volcanic soils, afternoon mists and year round sunshine yield a variety of produce. Tourists and locals alike vie for a taste of the island’s delectable tropical fruits and in season vegetables. Maui Preserved savors these beautiful harvests jar by jar by producing jams, pickles, sauces syrups, and vanilla beans. Timing is everything. How long does it take for a shipment to arrive from the mainland to the islands? Our cucumbers don’t take a boat ride! Starting with the highest-quality local produce, our products capture flavor at the peak of freshness for your enjoyment year round. protecting Maui’s ability to grow and eat locally. Maui Preserved allows our farmers to sell their produce reliably while maintaining stride to make Hawaii more sustainable. We are preserving our island’s food culture one jar at a time. Our products start and finish in Maui, giving a dependable excellence to our customers. Maui Preserved was started in June 2010 by Maleta Van Loan and Anthony LaBua. Maleta Van Loan graduated from The Natural Gourmet Institute for Health and Culinary Arts, New York in 2005. Starting as a line chef at Pure Food and Wine, Maleta evolved to manage not only restaurant finances but also their premier raw food snack line One Lucky Duck. Excelling in restaurant and food management, she continued her education at Baruch College, New York in 2008 pursuing professional studies in finance. Anthony LaBua worked throughout New York City, from Smith Street in Brooklyn to Olives in the W Hotel New York in Union Square, before becoming the Executive Sous Chef at the Fine dining restaurant Pure Food and Wine in 2006. While working Anthony also volunteered at the James Beard House in the West Village, and attended the Institute of Culinary Education while moonlighting there as a stagiare. He graduated with a degree in Culinary Management in 2008. Maleta and Anthony both obtained Certificates of Food Protection from the Department of Health and Mental Hygiene of New York. Considered one of the most stringent courses on Food Safety in the Nation, the certification enables them to manage their kitchen and food production to the highest of standards. Maui Preserved is hand packed in Haiku, Maui. For more information please send us an email at kerry@mauipreserved.com. 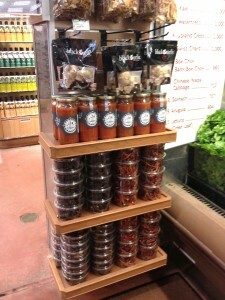 This entry was posted in Events, News and tagged maui, wholefoods. Bookmark the permalink.